Dr. Raymond Tolmos DC, DABCI, B.S. 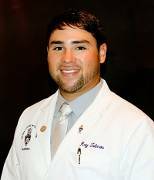 Dr. Raymond Tolmos is a graduate of the Florida State University with a B.S. in Exercise Physiology from the college of Human Sciences. Dr. Tolmos then attained his Doctorate of Chiropractic from Palmer College of Chiropractic in Florida. Along the way to his education, Dr. Tolmos was a personal trainer at the Florida State gym, L.A. Fitness, and Gold’s Gym as well. Besides one on one training and nutritional advice, Dr. Tolmos also taught group exercise classes. He feels that all of these experiences to this point have helped him become a better Doctor of Chiropractic. Growing up he was an avid participant in many kinds of sports. Baseball and Football being his favorite and also the ultimate cause of him becoming a Chiropractor. At the age of 14, Dr. Tolmos was experiencing debilitating pain in his upper back and the base of his neck. He was having trouble sleeping and as a result, his performance in both the classroom and on the field began to decrease. He went to see a Chiropractor and it changed his life so much, he has now decided to return the favor by living the Chiropractic lifestyle and trying to educate as many people as possible about the power that they have within them. In 2016, Dr. Tolmos received his diplomate as a DABCI. What is a DABCI? Diplomate in Diagnosis and Internal Disorders (DABCI). DABCI physicians are trained in modern medical diagnosis, functional medicine, and natural therapeutics. Chiropractic physicians with a DABCI post doctoral certification utilize conventional medical diagnostics, specialized functional testing, and holistic medicine diagnostic evaluations. DABCI physicians routinely employ methods such as blood laboratory studies, urinalyses, electrocardiograms, vascular doppler ultrasound, spirometry, DEXA bone density testing, salivary assay hormonal and neurotransmitter tests, IgG food allergy testing, diagnostic imaging to include x-ray, CT, MRI, comprehensive gastrointestinal stool analyses, and many other diagnostic tools. A DABCI uses therapeutic methods which emphasize conservative and minimally invasive approaches and minimize risk to the patient. Diplomates in diagnosis and internal disorders use treatments such as clinical nutrition, dietetics, exercise, vitamin and mineral supplementation, homeopathic medicine, botanical medicine, acupuncture, natural hormone replacement, and pharmacologic counseling. Many conditions and disease states can be resolved by utililzing these natural methods. The Council on Diagnosis of Internal Disorders promotes our physicians as uniquely qualified to provide this type of comprehensive natural medical care. Dr. Tolmos teaches our P.I.R. Technique, Rehabilitative Stretching for Athletes and Kinesio Taping CE Seminars.